The results of the referendum are in. It’s after midnight, so this will be a short post. But I cannot go to bed without saying a few words about the people’s vote and what this means for the European and global elite/bankers/oligarchs, which have used the EU and the eurozone to increase the wealth of the imperialist capitalist elite in Europe (mainly, the German banksters and uber-wealthy capitalists) by preying on poorer member nations and the working people of all EU nations (including Germany). 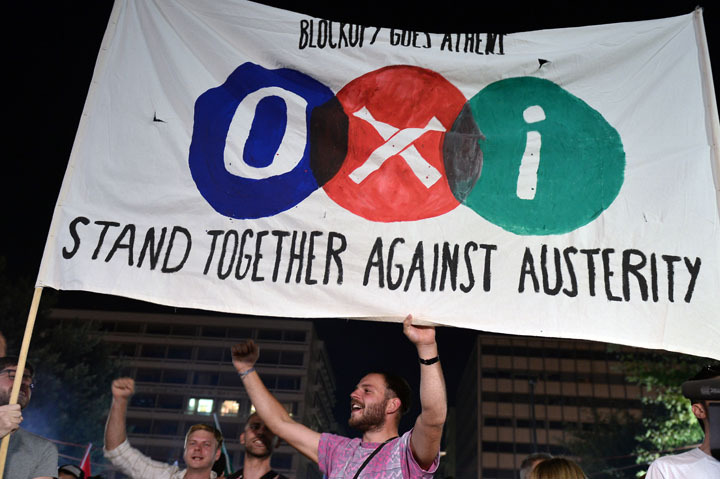 To understand the full significance, or potential, of today’s vote we must move beyond Greece and view what is unfolding there as but one symptom of the recurrent capitalist crises that are currently sweeping the globe. Monopoly capitalism, especially in its current globalized and regionalized form, is a predatory system that drives down the wages and living standards of working people (including the middle class). From its inception, the economic effect and aim of the EU and the euro has been to drive down the living standards of working people throughout Europe, while enriching the global banking and corporate elite. What is really at stake here is something that people in the west refuse to talk about: CLASS. Today in Greece the working and unemployed classes took a stand against predatory global capital and its oligarchs, banking system and crony institutions (the IMF, the European Commission and the European Central Bank or the Troika, collectively). It is one very small (yet significant) victory for ordinary people against the uber-wealthy global power elite. And it not just a victory for the people of Greece; it is a global victory. Economic austerity, increasing unemployment, decreasing wages and declining standards of living are things that currently plague working (and unemployed) people across the globe. What is happening in Greece is but one extreme example of what is happening and/or is to come elsewhere, especially in Southern and Eastern EU states. So when we think about the Greek referendum, we need to also think about what this means on a regional and global scale. In recent months the government of Greece did something governments very rarely do; it did not sell out completely. It (kind of) stood up to global economic power. And thankfully, the people did the same. The road ahead for Greece is not a clear or easy one, and many will claim that the people have just voted in their own economic doom; that they have sealed their fate. Indeed, the economy could collapse completely without the so-called bail out (i.e., greater austerity and debt slavery). But perhaps an artificial system that survives and is only propped up through ever increasing debt, impoverishment and human misery needs to collapse. Perhaps it is time to welcome the death of a parasitic economic system that only survives by feeding off of the majority of people. With thanks and solidarity to the people of Greece.